BeerKeep Beta v1.1 on the Android Market. BeerKeep is an app available for free on the Android Market, originally intended to be a replacement of the old school paper and pencil at beer tasting events. Since it's initial release however, there were many requests to allow the ability to take notes and rate beers when not at a festival. Version 1.1 solved this by adding a "Personal Tastings" section to the event list. What can BeerKeep do for you? First and foremost, BeerKeep was created as a method to make notes on beer using your Android phone. Starting at the event screen, you can either select "Personal Tastings" or any of the supported beer festivals (pre-loaded with the breweries at that event). From here you are presented with a list of the breweries, along with the average user ratings for the brewery (1 to 5 stars). When going deeper into a brewery, you get a list of the beers which also have average user ratings. Anybody can add a brewery, and anyone can add a beer. When this happens, your list is updated instantly. Everything is happening in real-time through the network. This serves as a great quick reference while out at the pub. 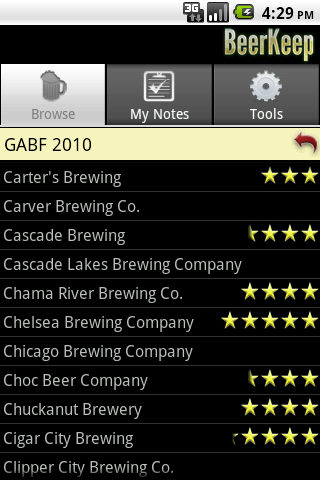 By sorting the breweries by user ratings or name, you can get a quick view of what you might want to try next. Add event. This feature is not currently implemented because initially I was hoping it would be easier to work with event planners to get a list of breweries and beers. Since that is not the case, an "Add Event" function is greatly needed to avoid manual intervention on my part to add events. Advanced notes. A lot of people love the ability to rate a beer without being required to enter a note. On the other end of the spectrum, there are some who wish there were separate sections to comment on individual aspects of the beer such as taste, aroma, appearance, etc. I plan on allowing the user to choose between a Basic view and an Advanced view that would provide the level of detail each person prefers. Community features. Compare your notes with your friends' notes, or complete strangers. See what others think before you spend $8 on that beer with a 2 out of 5 star rating. Web interface. This website will evolve into a much more full featured back-end to the application. Not only will it support everything the app does, but will allow some additional features that aren't quite so mobile friendly (printing, exporting lists). The app will still be King for ease of use while out drinking. More robust brewery/beer structure. Turns out, it isn't as simple as a brewery that makes a beer. These days with multibillion dollar beverage groups and contract brewers, the "brewery" distinction can be a grey area. In the future the structure will be a little more advanced to support brand owners (InBev, Diageo, etc.) and brands (Guinness, Hoegaarden, Samuel Smith, Corona, etc. ), while maintaining support for the microbreweries. Additionally, aliases for breweries and beers will be supported (i.e. Samuel Adams and Boston Beer Company will represent the same brewery). Maps? I'm tossing around the idea of implementing a maps feature so you can track where you tasted beers. However, I'm hesitant to do so because of the way Android permissions are set up. In order to retrieve your GPS location, you must permit the app to do so when installing. Because I would want users to have the option of providing the GPS location to the app, I figured its best just to leave this out for now. Optimally the user would be prompted to allow/disallow that permission during install, but currently that is not how the Android OS works. And even more wishful thinking... how cool would it be to have a GPS enabled map of the beer festival floor (obviously this wouldn't work indoors)? Interaction with external sites? It would be great to be able to read reviews from RateBeer and Beer Advocate, all from within a single app. The Phone that Jobs Built? While C++ is a different world from Java, I'd be willing to give iPhone development a shot if there was enough demand.